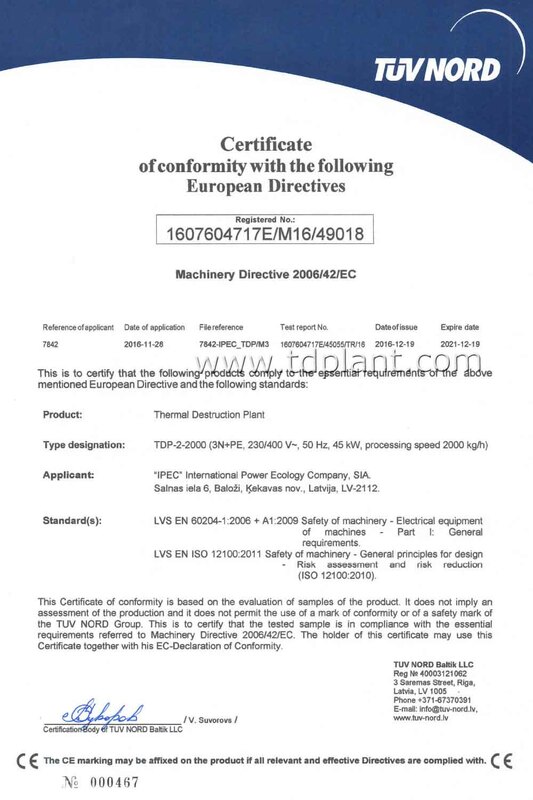 IPEC received International certificate of conformance with the requirements of the Directive 2006/42/EC on essential health and safety requirements of machinery for pyrolysis plant TDP-2-2000 of its make. 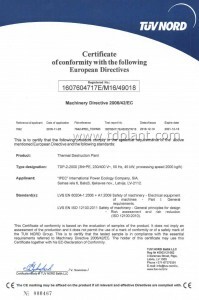 International certification body TÜV NORD issued the document on the basis of the test report. Pyrolysis plants of IPEC production are designed in accordance with the requirements specified in the Directive and meet the standards of EN 60204-1:2006+А1:2009 (Electrical equipment of vehicles and machinery) and EN ISO 12100:2011 (Engineering philosophy). Compliance of pyrolysis plant TDP-2-2000 with international standards gives IPEC the opportunity to start the implementation of numerous orders from the European Union, followed by unhindered export products to foreign clients.